On September 10, 2015, the United States Department of Labor Office of Federal Contract Compliance Programs (OFCCP) issued a supplemental poster to be used by government contractors and subcontractors. The OFCCP is working with the EEOC to update the existing poster and advises that the prior poster should be used along with the supplemental poster until further notice. A copy of the supplemental poster can be found here. 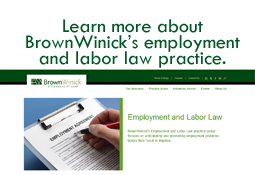 If you have any questions about postings, please do not hesitate to contact BrownWinick’s Employment and Labor Practice Group Co-Chair, Beth Coonan for more information.